Preface. The Naive and the Sophisticated Eye. Counterfeits Made to Beguile. Why Two Eyes Are Better than One. The Limits of Perspective. Views Typical and Otherwise. Communalities of Distortions. Cues Intrinsic to the Eye. Art Via Illusion. Art and Reality. Notes. References. Author Index. Subject Index. Perception and Artistic Style explores the role of visual processes in the creation and perception of painting and drawing. 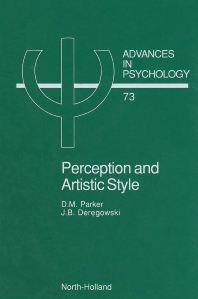 By looking at the relationship between perception and representation evidence is provided that purely visual processes are a richer source of artistic inspiration than is commonly realised. Many of the obvious variations in artistic style are firmly rooted in visual perception and visual cognition. This book looks at a range of fundamental visual processes and investigates their contribution to major stylistic features of works of art. A wide selection of pictures is considered; ancient, medieval, renaissance, nineteenth and twentieth century and primitive, and both well known and relatively obscure works are examined. The volume includes 86 figures, 13 grey-scale illustrations of artworks and 43 line drawings. This book will be of value to students of perception, students of art and art history, and, since the more technical aspects have been confined to the notes, the general reader who wishes to increase his/her appreciation and understanding of pictorial art.